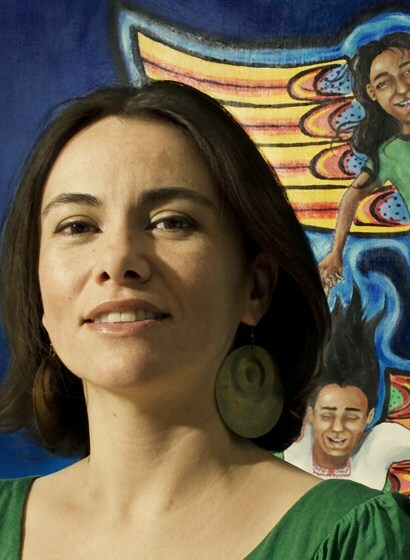 For the month of July, poet Olga Garcia, author of Falling Angels: Cuentos y Poemas, blogs about her experience facilitating poetry workshops as a longtime P&W-supported writer. It's May 2009 and the scorching sun casts long shadows on the streets of downtown Calexico. I’ve driven 230 miles southeast of Los Angeles, past the Salton Sea, to arrive in this furnace of a city that boasts three-digit temperatures. I’m here to facilitate an R/W-sponsored bilingual poetry workshop at Camarena Library, and I’ve arrived early enough to explore. When it comes to border towns, Calexico has it all: the U.S.-Mexico border you can walk up to, sniff, stare at, curse, or cross; señores in sombreros and thick leather belts; big women in church dresses, waving religious pamphlets in the air; a corner stop featuring menudo, donuts, and border patrol agents. Sure, there’s a Starbucks, a few Walmarts, but what tugs at me is the historic shopping district, the brick archways and columns, the cement bus benches, and the discount stores. Hours later, I arrive at Camarena Library, sweaty and a bit anxious. I’ve been teaching for twelve years, yet I feel like a novice. The unknowns of a workshop always stir me. Who will come? Adults? Teens? What language(s) will they speak? I’ve brought three different handouts with me—English, Spanish, and bilingual. I don’t know which one I’ll be using. Ten minutes until workshop and no one has arrived. Brief panic. Did I ditch work to go sightseeing? I flashback to Calexico’s rustic downtown, recalling its charm, the chilidogs I ate at a tiny stand and decide that even if nobody shows, the trip was worth it. They arrive. First a woman and two men. Then a mother with her teenaged son. Within minutes I have a small group curiously looking at the altar displayed on a table. I invite them to pick up the objects—seashells, ripe fruits, pictures of birds in flight, bright-colored plastic flowers purchased at one of Calexico’s fabulous discount stores. In our introductions I learn that almost everyone is bilingual. Now I know what materials to use, what exercises to dive into. A workshop, though, is much more than a pre-planned lesson. It’s a breathing thing with a collective pulse. Each class generates its own unique energy. In Calexico, the group is intimate and quiet. I feel the need to chat before we begin. When I tell them I live in Los Angeles, they’re surprised at how far I’ve traveled for this two-hour workshop. “I’ve wanted to visit Calexico for years,” I tell them. They look at me like I’m crazy. I confess that having grown up between two languages and cultures, I have a thing for border towns. I relay my day’s adventures in downtown, how I snapped hundreds of photos and interviewed residents on the streets as if I were a journalist. They laugh, opening up, sharing a few of their own stories and insights about their hometown. We delve into our poetry workshop like this, crossing borders...connecting. Photos: (Top) Olga Garcia. Credit: Weenobee.com; (bottom) workshop participants. Credit: Olga Garcia. On May 5 Detroit’s InsideOut Literary Arts Project held its first annual youth writing conference, featuring P&W-supported writers Eddie B. Allen, Matt Bell, Nandi Comer, jessica Care moore, Norene Cashen Smith, and Marcus Wicker. We asked project director Alise Alousi to describe the event. Who Understands Me But Me: A Youth Voices Conference (titled after a poem by Jimmy Santiago Baca) was the culminating event for a year of programming focused on Baca’s essay collection, Stories from the Edge. InsideOut students used the essays in the collection as a model for developing their own personal narratives. The goal was to give 150 Detroit public high school students an opportunity to attend a daylong event similar in content and format to that of an adult writing conference. Baca led a writing workshop and presented keynote remarks for the conference, which was supported by Poets & Writers and the JP Morgan Chase Foundation. Workshops were also led by a talented group of local writers including: Matt Bell, Nandi Comer, Peter Markus, jessica Care moore, Matthew Olzmann, Marcus Wicker, and InsideOut founder Dr. Terry Blackhawk. Students preregistered for the conference, choosing their top six workshops from a list of twelve. Titles of workshops included: Trigger, Memory, Return: Juggling the Poetic Flashback; Hustle with a Ghazal: Innovation Through an Ancient Form; Urban Fiction and Realities, and The Event as Inspiration for Flash Fiction. but when he threw that punch I threw my love. with my punch to his jaw the world became clear. and the lovely jolt of his neck, its grace. Central to InsideOut’s mission is a belief in the power of self-expression and language as a means to transform lives and build community. One of the most exciting moments of the event took place during lunch when students, many of whom had never read before an audience this large, shared what they had written in their morning workshops. Students supported each other by snapping their fingers and applauding. This was followed by Baca’s remarks, which took students through his own self-discovery and belief that all individuals should set everyday goals as a way to embrace their potential. Photo: Marcus Wicker. Credit: Jacob Shores-Arguello. Support for Readings/Workshops events in Detroit is provided by an endowment established with generous contributions from the Poets & Writers Board of Directors and others. Additional support comes from the Friends of Poets & Writers. Poet Kelly Norman Ellis, author of Tougaloo Blues and longtime P&W-supported writer and presenter of literary events, dotes on Chicago's South Side and the Neighborhood Writing Alliance. I’ve lived and worked on Chicago’s South Side for almost thirteen years. As an educator and writer, I am attracted to organizations that express a commitment to writing and art outside the academic community. Our writing program at Chicago State seeks to coalition build with community organizations so that our students realize the benefits and necessity of teaching outside of the academy. The Neighborhood Writing Alliance (NWA) located on the South Side of Chicago fills this need. NWA runs writing workshops for adults in low-income neighborhoods throughout Chicago, and publishes selected pieces from those workshops in its quarterly award-winning publication, Journal of Ordinary Thought (JOT). Founded in 1996 by Hal Adams, Deborah Epstein, and Sunny Fischer, NWA grew out of JOT, which was founded by Hal Adams in 1991. Hundreds of Chicago adults have participated in NWA writing groups in a range of settings—from public libraries and public schools (where parents participate) to social service agencies and public housing projects. Workshops are conducted across ethnic lines. In one workshop, I taught African Americans born in Chicago, Mississippi, and Jamaica; Polish immigrants; fourth generation Irish Americans and second generation Mexican Americans. Participants in these workshops write primarily from their own experience, but through writing and discussion make connections between their personal experiences and broader social issues. Workshop leaders are Chicago-based professional writers and arts educators such as Krista Franklin, Toni Asante Lightfoot, Parneshia Jones, Tony Lindsay, Carlos Flores, and Valerie Wallace, to name a few. NWA also has an impressive Writer’s Advisory Council, which includes Achy Obejas, Alex Kotlowitz, television journalist Bill Kurtis. The legendary Studs Turkel also served on the council before his death. 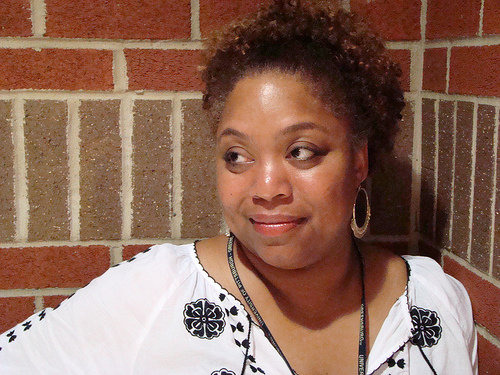 Our MFA program at Chicago State believes in the connection of writing and social justice. NWA demonstrates this principal at work by providing internships to our writing students on the graduate and undergraduate level, allowing them to experience the successful marriage of art and activism. Photo: Kelly Norman Ellis. Credit: Natasha Marin. Support for Readings/Workshops events in Chicago is provided by an endowment established with generous contributions from Poets & Writers Board of Directors and others. Additional support comes from the Friends of Poets & Writers. Chicago-based poet Kelly Norman Ellis, author of Tougaloo Blues and longtime P&W-supported writer and presenter of literary events, bigs up the Guild Literary Complex's Palabra Pura literary series. 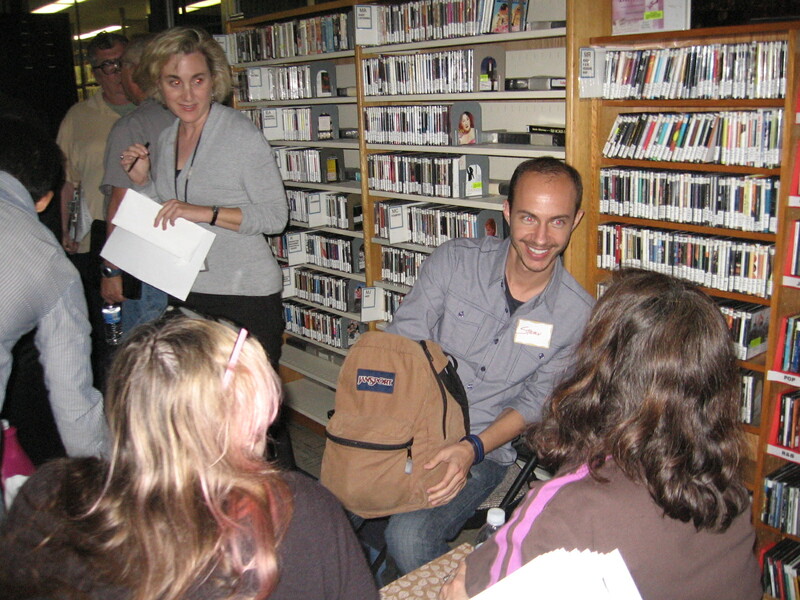 Once of my first experiences with literary community when I moved to Chicago was with the Guild Literary Complex, a community-based literary organization. Thirteen years ago I attended a writing workshop lead by poet Afaa Michael Weaver. I remember sharing space with then emerging writers Tyehimba Jess, Tara Betts, Reggie Gibson, Quraysh Ali Lansana, and the late Nicole Shields. I found my first Chicago writing family at the Guild and was welcomed into the safe space where we talked and worked our poems into the world. One of the Guild’s strengths is its commitment to dialogue between artists of different backgrounds and sensibilities. My most recent experience with the Guild was with the Palabra Pura literary series. Palabra Pura promotes literary expression in more than one tongue through a monthly bilingual poetry reading featuring Chicano and Latino writers and African American writers. I was paired with writer Sandra Posadas in the Puerto Rican neighborhood of Humboldt Park. 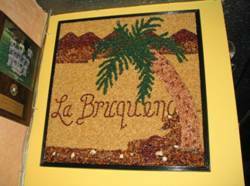 Hosted at La Bruquena, an amazing Puerto Rican restaurant, the reading positioned our literary discussion in the middle of a community that inspires the art we study and create. These types of interactions are usually the domain of academic institutions, but the Guild believes art belongs to the people who inspire it. The work of the Guild reminds us that art is not created in a vacuum. The interaction and creative exchange between diverse writers’ communities creates more art, better art, and more safe spaces for that art to breathe. Poet Kelly Norman Ellis, author of Tougaloo Blues and longtime P&W-supported writer and presenter of literary events, spotlights Chicago's Proyecto Latina and its famed Chisme Box. One of the blessings of living and working in Chicago is the great ethnic and racial diversity. I am often humbled at the hard work of community arts organizations in my city and their commitment to representing this great diversity. These organizations bring quality art to the people for little or no charge and are essential relationships in building a literary community outside the boundaries of college classrooms and MFA programs. Because CSU is a university serving mostly black and brown people, the importance of coalition building is critical to exposing these people to the work of writers who live and work in these communities of color. One such organization is Proyecto Latina. Proyecto Latina is a multimedia project that amplifies the success and impact of Latinas by sponsoring a reading series and a website that allows women to create a culture of self-empowerment, spotlight emerging and established Latina talent, create safe spaces in underserved communities, provide a virtual platform to chronicle stories, share resources, and start dialogue. The third Monday of every month Proyecto celebrates the creativity of a Latina artist. The roster of writers is very impressive. Writers such as Xanath Caraza, Yolanda Nieves, Awilda Lupe Gonzalez have all graced the Proyecto Latina mike. The website includes advice for emerging writers, interviews with established writers, and information about the work of Latina writers in the Chicago community and abroad. Also on the Proyecto Latina website is a photograph of the Chisme Box (Chisme means "gossip" in Spanish). It’s described as “a regular at our monthly readings and she loves to interact with everyone. She loves the buzz of a crowded room and has the bad habit of eavesdropping on everyone, but rest assured she can keep a secret. Despite her name she prefers funny confessionals to mean-spirited gossip and is unapologetic about spitting out deposits that don’t sit well with her." 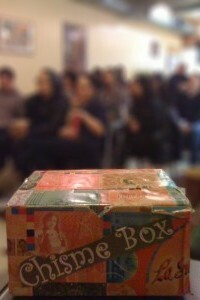 The Chisme Box is a way to share stories, information, wisdom, truth. As our writing program grows at CSU, I will be reminded of the Proyecto Latina’s Chisme Box and the ways artist make worlds whereever we go. We asked Emily Rubin, author of the debut novel, Stalina, to share her experience running the P&W-sponsored Dirty Laundry reading series. In 2005, I cofounded Wash and Dry Productions to produce Dirty Laundry: Loads of Prose (DLLOP), the reading series that takes place in working Laundromats across the country. 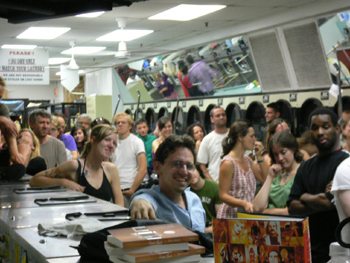 The idea to bring writers to local Laundromats came about one evening in a brainstorm session over a couple of beers with my friend and writer Gregory Rossi. We wanted to organize a series in a nontraditional setting where writers could share their work with their fans as well as people outside the literary community. Sitting outside at Zum Schneider, a new German beer garden on Avenue C, on the Lower East Side of Manhattan, we looked down the avenue considering places we might hold the readings. There was a bodega, a church, a Chinese restaurant, and then, at East Fifth Street, the Ave C Laundromat. Our eyes opened wide and we knew we had our venue. At the time, the third annual HOWL! Festival was organizing and the producers invited us to participate. Sam Lipsyte and Legs McNeill read at the first Dirty Laundry: Loads of Prose to more than seventy people at the Avenue C Laundromat that August. The writers and audience were enthusiastic and wanted to know when and where the next Laundromat reading would take place. Since then there have been more than thirty readings and close to one hundred writers have been presented in between the washers and dryers throughout the New York City metropolitan area. We have taken the show on the road and presented local writers in Laundromats in San Francisco; Boulder, Colorado; and Stockbridge, Massachusetts. Poets & Writers' Readings/Workshops program funded a dozen readings in New York City from 2006 to the present. The Lower Manhattan Cultural Council and Meet the Composer have provided additional funding for the program. The series has been covered extensively in the press with articles in the Villager, Time Out NY, Brooklyn Rail, and several international journals as well. It has also aired on television on NBC, Reuters, and the NY Bureau of Russian TV, featuring radio interviews with writers and myself for National Public Radio and the BBC. Support for Readings/Workshops in New York City is provided, in part, by public funds from the New York State Council on the Arts, and the New York City Department of Cultural Affairs, with additional support from the Louis & Anne Abrons Foundation, the Axe-Houghton Foundation, the A.K. Starr Charitable Trust, and the Friends of Poets & Writers. For the month of June, poet Kelly Norman Ellis, author of Tougaloo Blues and longtime P&W-supported writer and presenter of literary events, will spotlight Chicago's literary landscape. I love what I do. I get to talk to smart, talented people about words. 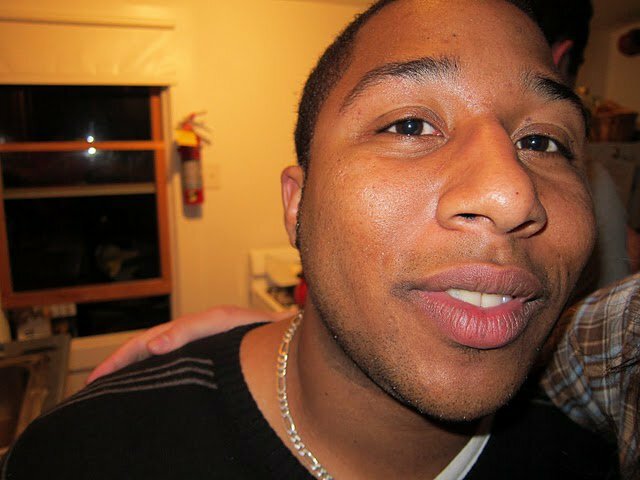 I am the director of creative writing at Chicago State University (CSU). But the nature of directing a creative writing program at an underfunded state university tests my creative endurance and that of my colleagues each year. Our MFA program’s sister institution, the Gwendolyn Brooks Center for Black Literature and Creative Writing (GBC), has been the saving grace of our program. The GBC, named in honor of the esteemed Pulitzer Prize winner and Illinois poet laureate, serves as the home of the MFA program, a meeting place for creative writing students, both graduate and undergraduate, and provides literary readings and workshops, mostly famously the Gwendolyn Brooks Conference. Because of financial constraints, our writing program does not have a formal writers series, but the GBC's programming and physical space have kept our creative writing program thriving. The center and its directors both past and present (Professor Haki R Madhubuti, Dr. Joyce E Joyce, the late Dr. B.J. Bolden and Professor Quraysh Ali Lansana) have provided an important literary environment for the university and Chicago’s south side communities. The center is a world within a world. This world includes a video archive of literary readings by Sonia Sanchez, Toni Cade Bambara, John Edgar Wideman, bell hooks, Edward P. Jones, Amiri Baraka, Saul Williams, and Lucille Clifton and scholars Houston Baker, Maryemma Graham, Joanne Gabbin, and Cheryl Clarke, among others. The center’s dedication to social justice through the HYPE program, which works to educate young people about AIDS/HIV, has produced two anthologies (Fingernails Across the Chalkboard and Spaces Between Us), co-edited by graduates of our writing program (ML Hunter and Randall Horton). Centers like the GBC are a cultural and artistic lifeline for a community of black and brown people struggling against oppressive forces. In this small space, contemporary writers have shared their words and expertise with the students of CSU and the surrounding communities with workshops and readings; Martin Espada, Thomas Sayers Ellis, Honoree Fannon Jeffers, Crystal Wilkerson, Frank X Walker, Roger Bonair-Agard, Jessica Care Moore, and Achy Obejas have done this work for little or no financial reward. They serve the community because of their commitment to writing and the right of every person to own her own stories and to craft those stories with the attention they deserve. It is possible to make a world with what you have. Even though we do not have vast financial resources, we have the commitment of writers around the country who believe in the necessity of art in the lives of every person. Every day I enter our small space and am greeted by the portraits of Lorraine Hansberry, Langston Hughes, Richard Wright, and, of course, Gwendolyn Brooks. I walk into the space where Ms. Brooks taught poetry and where she made a world fashioned from poems... And what a world it is. On a recent Tuesday night, a group of budding poets squeezed around a plate of chocolate chip and circus animal cookies in the soon-to-be-remodeled West Hollywood Library in California. They were there for The Poetics of Your Life, an autobiographical poetry workshop led by P&W-sponsored writer Steven Reigns and founded on the premise that a safe writing space is the best place to excavate memories. After reading and reflecting on poems by Dorianne Laux and Deborah Paredez, and warming up with a group erasure poem, he issued the first prompt: Write about a fire in your life. The responses were both literal and metaphorical, ranging from a car fire to a self-inflicted iron burn to a dancer’s internal fire. Following his reading a poem called “Wedding Dress,” in which poet Michael Waters warmly recalls wearing his wife’s bridal gown for Halloween, Reigns asked the group to write about a time they’d cross-dressed or worn an item of clothing belonging to the opposite gender. Whether it was about slapping on a fake mustache for a costume party or falling in love with previously off-limits designer ball gowns, everyone produced poems of self-discovery. With just a few minutes left of the two-hour workshop, Reigns encouraged anyone who wanted to share but had been too shy to step forward. A small handful did, and their poems clearly moved the group. Reigns then issued a last, last call, and it happened again. Photo: Steven Reigns with workshop participants. Credit: Cheryl Klein. Camille Rankine, program and communications coordinator at Cave Canem Foundation, gives us the rundown on the organization's partnership with Willow Books, imprint of P&W-supported Aquarius Press in Detroit. Each year since its founding, Cave Canem has published commemorative anthologies of poems produced by fellows and faculty attending the organization’s annual retreat. In 2006, this endeavor culminated in Gathering Ground: A Reader Celebrating Cave Canem’s First Decade, published by University of Michigan Press. This year marks the start of a new take on this tradition: Cave Canem will partner with Willow Books to produce the Cave Canem Anthology series, which will be published biennially, revitalizing a tradition of showcasing exciting new directions in American poetry. The series will be inaugurated with the publication of Cave Canem XII: Poems 2008–2009, slated for release in fall 2011 or spring 2012. 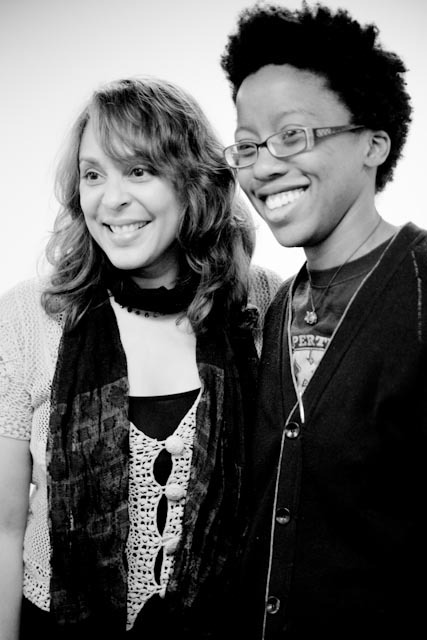 Photo: (Left to right) First annual Cave Canem Poetry Prize winner Natasha Trethewey and Cave Canem Fellow Donika Ross. Credit: Rachel Eliza Griffiths.